In Ayurvedic medicine, our tendency to be a certain way from birth is described as pakriti. It’s a Sanskrit word meaning “our basic constitution.” This constitution was determined at conception and combines mental and physical tendencies that were passed down through possibly hundreds of generations that came before you. Pakriti does not determine your fate; but it does indicate certain ways that you might better support your health. Pakriti is further detailed in Ayurvedic medicine by assigning a dosha to an individual. A dosha can best be described as a body-element, since Ayurveda teaches that all of life, including humans, are part of the five elements: ether, air, fire, water and earth. Each of these is a different form of energy which is usually dominant in us, ranging from the subtle and light energies of air and ether, to the denser, gross energies of earth. The description of these five elements/energies in the English language is a bit difficult, because we don’t have exact words that mean the same thing as in the Sanskrit language, the Mother tongue of Ayurveda. However, we can get a general idea of what ancient Ayurvedic masters intended. We are all different individuals, but fire at a campsite still has the same qualities as fire in our fireplaces, and water running down from a mountain top has the same qualities as water which flows in the ocean. Therefore, there are only seven doshas, or bio-energy types, in the Ayurvedic system of medicine. We’ll explain what each of these mean in more detail momentarily. You may have noticed that there are only three doshas combined to make up any particular pakriti. Knowing your dosha can help you make better choices to affect your health in a positive way. For instance, if you tend to have dry skin with a Vata-predominant dosha, you may need to apply coconut oil every morning after you shower. If you are Kapha predominant, this isn’t a beauty regime you’d likely practice, because your skin tends to be oily. Another example of caring for your body and mind according to your dosha would be Ayurvedic suggestions for how you eat and which herbs you will most benefit from. Pitta people, for example, may not do well digesting spicy, heavy foods, as they are already very fiery by nature. Pitta people can benefit from eating things like melons and pears, because they have a cooling effect on the body and help to prevent inflammation. Conversely, a Kapha-predominate personality could benefit from eating melt-your-face peppers because they tend to have slow digestion. The capsaicin in peppers, along with other compounds in onions and highly spiced food, can help jump-start their digestion. 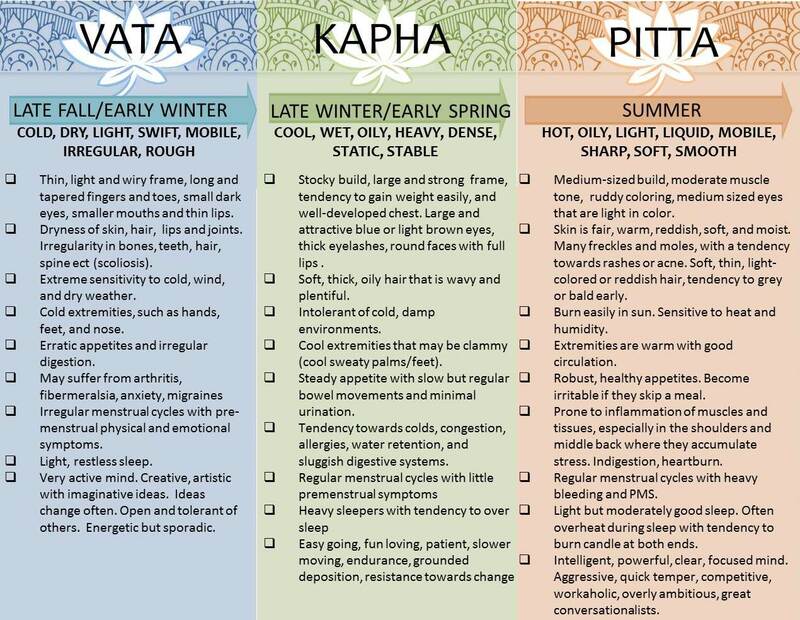 In brief, a Kapha menu would look very different from a Pitta menu or a Vata menu, even though some foods might overlap. Eating according to your personal dosha, aside from just “eating healthy”, can greatly improve your health because your body will tend to metabolize and process what you eat and drink differently according to your prakriti. To get a really accurate sense of what dosha you are without visiting an Ayurvedic doctor in person, take at least two of the quizzes. If you get the same answer (dosha type) in both, you can likely count on it being correct. Once you are armed with this knowledge about your personal constitution, you can then dig deeper and learn more about how to care for your dosha – YOU!